When there are customers who overpay their invoices, there will be outstanding accounts for some customers and this will result to bad debt. A formal debit note document has to be issued and properly recorded into the system so your staffs can take action on recovering the outstanding amounts. In BMO Online Inventory Management System, you will be able to create the debit memo easily, complete with filtered search function. You can create a new debit note in BMO Online Inventory Management System by following the steps as shown as below. 1. 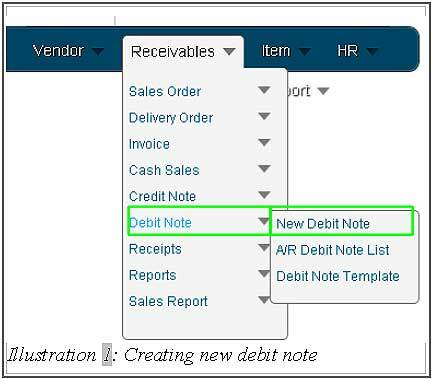 Click on the “New Debit Note”(Receivables > Debit Note > New Debit Note) on the navigation menu bar. 3. Adding a “Credit Account” by click on “Add Line” button. click on the icon to look up a credit account. The “description” is optional, by the way the “currency” and “rate” will change automatically by the system. Next, user can choose an “amount for the credit account. Lastly, user can delete it by an x icon. 4.This is the Terms and Conditions as shown below. The user can click on the word Terms and Conditions to see the details of Terms and Conditions. Click again will be hide. 5. After all, click on “Save” and message will appear. While the message appear and click on OK button.